Fab article on acupressure for morning sickness in pregnancy. Has clear photos of where the points are ….. Anyone who’s suffered from morning sickness knows it can strike at anytime. Morning, noon or night, this little blighter doesn’t know when to quit. When it comes on in the middle of the night it can be particularly challenging. What can you do? You are so tired and trying to get out of bed is unthinkable as your other half is blissfully unaware snoring away deep in their peaceful slumber. This, my friends, is where acupressure comes into its own. In these little moments, a firm push on your favourite point will quell the endless waves and let you get some well-earned rest. The key is to find the point that works for you! 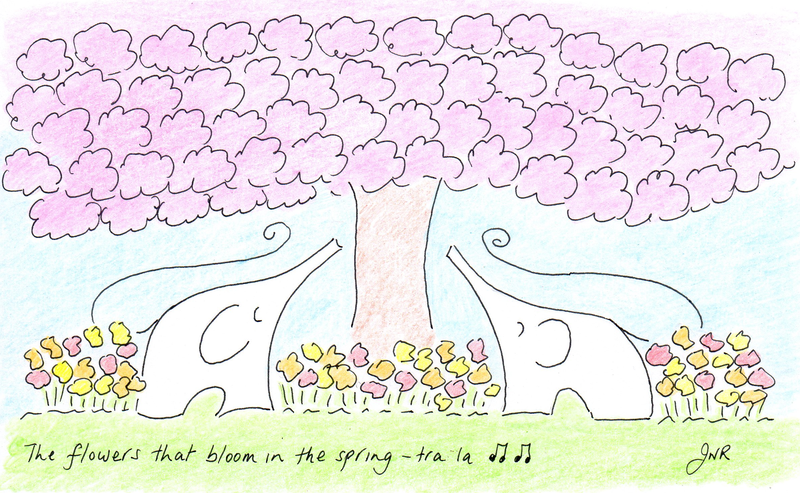 The Flowers that bloom in the spring – tra la !! The Japanese have an ancient custom known as “Hanami” which literally translates as “flower viewing” and refers to the celebration and enjoyment of the cherry blossoms which bloom all over the country from the end of March to early May. In modern-day Japan it’s an excuse for a party or two, and they even have a “blossom forecast” given out by their weather bureau!! In his poem “Leisure”, W.H. Davies asks “What is this life, if full of care, we have no time to stand and stare” and sadly today in our hamster–wheel stress-fest existence, we don’t often stop to smell the roses or appreciate the little things in nature which can give so much pleasure. Spring equinox heralds a new energy, and with it a palette of breathtaking colours brought to you by Mother Earth. It seems a shame to miss it, head down trying to get to our destination, without truly enjoying each day’s journey. Nature gives us a really good excuse to pause for a while, draw breath and enjoy the moment, letting the stresses of the day fade into the background, and allowing us to recharge, a mini-meditation of sorts. Book in a spot of “hanami” into your life this spring equinox, and keep up the practice throughout the year to watch the ever-changing colours that Nature has to offer. Hitting the pause button now and again is good for you, and resting your eyes on nature whilst doing so is food for the soul!! This Sunday, the UK celebrates Mothering Sunday. We are all mothers in our own way. We like to “mother” or nurture others, whether it is family, friends, pets or plants. The problem is when we are giving, giving, giving without replenishing our own stores! Women, especially, seem so busy giving their energy to others that they neglect the very person that needs that energy most – themselves!! You have no doubt heard the advice on a plane that when the oxygen masks come down, you first put on your own before helping others. The natural instinct to help a child first is little use if you are gasping for breath yourself. As selfish as it may seem to put yourself in number one position, it is in fact common sense. Far too many women are running on empty!!! Take time to replenish your vessel. Creating healthy habits such as drinking water, eating healthily and getting a good night’s sleep every day is a good start. So, too, is waving goodbye to the old habits which deplete us, such as relying too heavily on stimulants and thinking that we can get away without much sleep etc. Carving a little me-time in the stress-fest of life helps to nurture ourselves too. Perhaps reading something inspiring, taking time on a hobby, or enjoying some quiet time on a solitary walk or in meditation can also be uplifting and recharging. If you don’t take time to recharge your batteries, you run the risk of losing energy, your mojo and your joy in life. We also run the risk of putting far too many extra demands on our cells. Instead of using their precious resources to help you become the vibrant joyous creature you are meant to be, they are firefighting, using every spare drop of energy on combating the stress which you are creating for them. Eventually this can lead to ill health. 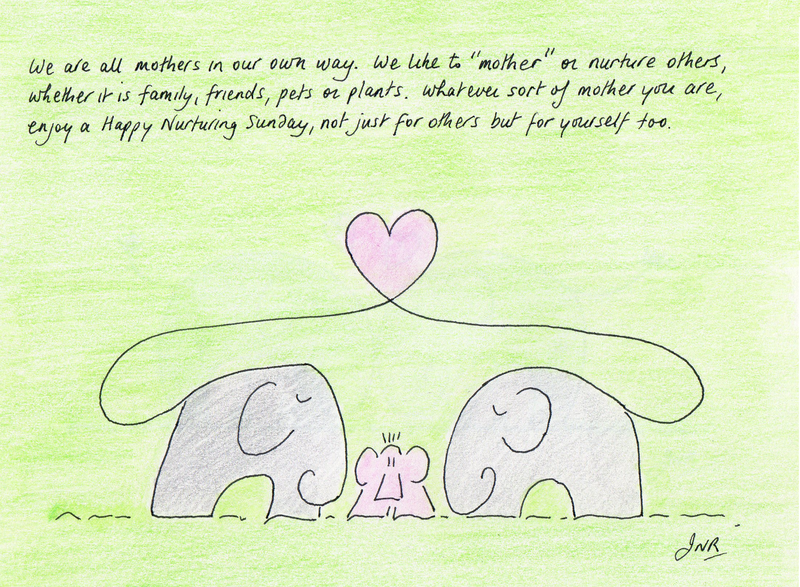 Whatever sort of mother you are, enjoy a Happy Nurturing Sunday, not just for others but for yourself too, and use this day to promise yourself some necessary daily self-nurturing.